First birthday portraits don't always have to come with a Cake smash in Boston, but they can! Sometimes you just want to document the milestone and that's okay! We always try and find a theme and color scheme that fits the child. 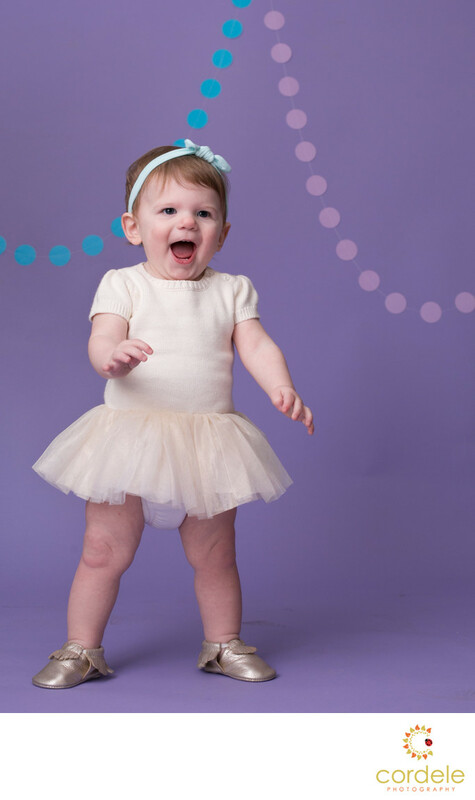 In this first birthday photo example, she wanted a purple backdrop to match her gray and teal room. The history of the idea is spotty at best. Something it's just a thing parents have always done. While others say it's homage to the Wedding Cake. I'm not sure where it came from but put the cake in front of the babies and let them smash away. I am happy to take photos!